The club has been opening reservation to join this trip to a vineyard at Hochheimer Terasse. Unfortunately the reservation is already closed. On Sunday, Aug. 12, 2018, starting from 11.00 a.m., this event will kick off at Hochheimer Terasse. The participants will have brunch first, before proceeding to tour the vineyard around the venue. 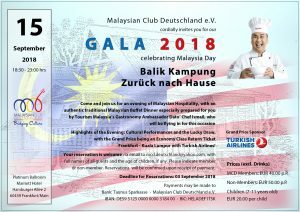 In conjunction with the 55’th Malaysia Day, our gala will take place on Sept. 15, 208 at the Marriott Hotel in Frankfurt am Main. Our Tourism Malaysia’s Gastronomy Ambassador Dato’ Chef Ismail Ahmad will be here! Lucky draw (Tombola) with the grand price: one economy class return flight ticket FRA – KUL with Turkish Airlines. Club members: € 40.00 p.p. Children (7 – 11 years old): € 20.00 p.p. Reservation before Sept. 3, 2018. Please kindly send an e-mail to mcd.deutscland@yahoo.com .